After seeing a call for artwork for Ubuntu 10.10 wallpapers on OMG! Ubuntu, I submitted a handful of photos to the Ubuntu Artwork pool on Flickr, just for kicks. Not long after, I discovered that two of my photos-- the feather and the happy cinnamon-- made the final 17 chosen for inclusion in the Maverick release. It's an honor, and a geeky dream come true. To celebrate the release of Ubuntu 10.10, here are the stories behind the two photos. Described as "the less interesting picture, but better desktop wallpaper", the feather has an equally unremarkable story. I had recently acquired a Canon MP-E 65mm f/2.8 1-5x Macro lens, and had gotten into the habit of crawling around the floor, taking macro pictures of anything that looked interesting. (I even walked up to my boss and asked if I could take a macro picture of his shirt, and he kindly humored me.) 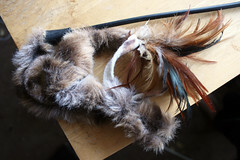 One of the things I found to take a picture of was a cat toy that had feathers on it-- and out of that cat toy, the feather photo was born. I've posted over 50,000 photos to Flickr, so a competition for my "favorite photograph" would be a fierce one. Happy Cinnamon would undoubtedly make the top 5. It was January 25, 2008, and a cold Chicago winter. Andy and I went up to Devon Ave., home of the Patel Brothers grocery store and super-cheap spices. We had some mulled wine at ZooLights a few weeks earlier, and needed some cinnamon sticks to re-create the experience. I took one out of the package and looked at it from one end, and was utterly delighted to see it smiling at me. That photo became my picture-of-the-day for January 25th. March came, and it was still cold and dreary, and I decided that my part of the office (which included the door to the entire space) needed some color... much to the chagrin of my more button-down co-workers. I put up a rainbrow made of macro photos of food, and encouraged visitors to guess what each photo was while they were waiting. Happy cinnamon, the wrong hue to be included in the rainbow, got the place of honor: right opposite the door, so it could greet everyone who walked in. 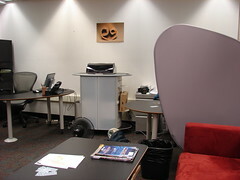 I eventually re-decorated, then moved offices, but I took Happy Cinnamon home. It's bounced around my apartment, but most recently it's been positioned between the kitchen and the living room. Every morning when I open the bedroom door, Happy Cinnamon is smiling at me from the other end of the hallway. 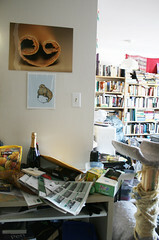 Every evening when I come home from work, Happy Cinnamon is there, above the table where I pile stuff to sort out later. Whether or not Happy Cinnamon is the best choice for a desktop wallpaper (the point has been well-made that there's perhaps too much contrast for it to be ideal), I'm glad my serendipitous realization that cinnamon sticks smile at you is today in the hands of thousands. 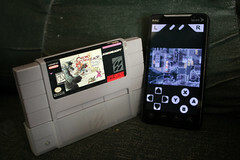 I was delighted to discover SNesoid for Android, which has let me relive my favorite childhood games, particularly Chrono Trigger. But in 2300 AD, after spending a half-hour chasing a rat across the screen to extract the password from it, it looked like SNesoid wasn't able to support hitting the three necessary buttons together (L + R, then A). And then this Android Forum thread caused me to look into key mapping. 3) Scroll down and select Button A. When it says Press a hardware key... press one that doesn't already cause a change of state in the app (i.e., don't choose the "home" or "menu" buttons.) I went with the volume down button. And that's all! Go back to the key mappings interface and get rid of the key assignment for Button A, and head across the bridge discover that Lavos destroyed the world in 1999. Note: I'm running SNesoid 2.0.4 on an Unrevoked Forever Evo 4G with Froyo. Your mileage may vary. Additional dorky footnote: I loved Chrono Trigger so much that I made a mask of Mune in art class when I was 11, and spent hours playing the game and transcribing all the dialog in a Word file that I then used to write a novelization that inevitably focused primarily on Lucca, my very favorite character. Embarrassingly, in re-playing the game I discovered I can still quote back much of the dialog before even seeing it. 2/24/11 UPDATE: The recent release of Frogr 0.4 makes this post obsolete. It's the Flickr uploader for Ubuntu I've been waiting for. It does everything I was looking for, and more-- I highly encourage anyone looking for a Flickr solution on Ubuntu to go download it. Long story short, none of the Linux-native software I was able to get working (on 64-bit Jaunty or Karmic, or 32-bit Lucid) made the cut. Fortunately, the official Windows Flickr Uploadr (v. 3.2.1) installed flawlessly on Wine (v. 1.1.31)... but only on Jaunty and Karmic. On Lucid, it installs fine but throws an XULRunner error, "Couldn't load XPCom", that I haven't been able to get around. Largely because of this issue, I'm hesitant to upgrade my Karmic machine to Lucid. Solid Flickr uploading software is a must, and in Karmic, the Windows Uploadr works like a dream. On my work Mac, canceling an upload in Flickr Uploadr (intentionally, or through losing the wireless connection) not-infrequently meant losing all the work I'd done on the remaining photos, but the Windows version on Wine consistently saves data, even when you shut it down in the middle of an upload, or lose connectivity. If you're running Lucid, and the official Flickr Uploadr isn't an option, here's a comparison and description of the other software I tried. My recommendation on Lucid would have to be jUploadr-- it's a bit annoying to use, it has a number of shortcomings (see below), but the features are there and it won't crash your machine. I initially used F-Spot for importing images and automatically organizing them into date-based folders, like I used to do in Bridge CS4. Annoyingly, even though Ubuntu offers to import the photos using F-Spot when you attach your card reader, it'll only do the date-based organization if you start the import from within F-Spot itself. I've switched to Shotwell (and so will Ubuntu, in 10.10) and been much happier with it. F-Spot really falls short on the Flickr uploading front (Photo > Export to > Flickr). A bit of Googling appears to have confirmed my suspicion that you can't rename photos in F-Spot-- not to mention giving the photos new titles specifically for the upload. The tags you assign in F-Spot carry over when you upload the image, but you have to pre-populate the F-Spot database with the tags. I've got far too many tags for that to be plausible; additionally, the tags are only saved within F-Spot, so if you switch software, you lose your tags. You can add a description for Flickr in the "Comment" field (at the bottom in the "Edit Image" view), and you can fiddle with the privacy settings, but there's no way to identify the content type or add the photo to a set. As a photo organizer, Shotwell is a step up from F-Spot. Being able to assign comma-separated tags is a major improvement over pre-populating a database. Other than that, Shotwell suffers from all the same Flickr uploading shortcomings as F-Spot. No assigning titles (nor renaming the photo within Shotwell), descriptions, or sets; permissions are limited to visibility. The worst part is, on my netbook running Lucid (10.04), Shotwell crashes as soon as I try to upload anything. Of all the Linux-friendly software I've tried, jUploadr has one of the best sets of features. It meets all my requirements, and then some (it has a nice option for adding geo data). The UI, though, drives me crazy. It distorts the preview of the images. I hate having to right-click on an image to get the metadata options to show up-- and they do so in another window. And if it crashes, unlike the official Flickr Uploadr it doesn't try to save your data. Worse, if you drop a group of photos in there, it uploads them backwards-- the last one you put in is the first one that gets uploaded, which will mess up the chronology of your photostream if you don't plan ahead and carefully drop your photos in there, one-by-one, in reverse chronological order. No sorting options or re-arranging available. It also doesn't seem to always respect the metadata (available with some cameras) that indicates whether your photo was taken in portrait or landscape mode, so it won't show the photos rotated in the preview. If you try to fix them yourself with the jUploadr rotate button, the upload will get screwed up as Flickr rotates them one more time. So just tilt your head while you're adding tags. Postr, the GNOME Flickr uploadr, might just be the perfect solution... if I could get it to work. The integration with the GNOME desktop is convenient, it meets all my criteria, but on my laptop running Karmic (9.10), shortly after I add an image and before I can do anything with it, I get flooded with "User timeout caused connection failure" messages that at times completely freeze up my whole system. It looks like it's not the most common problem (Bugzilla still lists it as unconfirmed), so perhaps others will have better luck. I managed to get it to work, briefly, on Lucid. One beautiful afternoon I was able to upload 11 photos. The experience could've been better-- when you're doing a multi-photo batch, it does tell you what photo it's on, but not when you're uploading a single photo there's no way to tell if it's frozen or actually uploading. Unfortunately, the next time I tried to use Postr, I was flooded with error messages-- different ones, about not being able to contact the host (no other programs were having connectivity issues), another message about a timeout. Often the error boxes would pop up without any text in them. More than once, it completely locked up my system and I had to do a hard reboot. Uninstalling, reinstalling, re-authenticating, nothing helped. Thanks to a clever Sprint employee who secretly stockpiled the coveted phone for new customers, I've had an Evo 4G since the day after it was released. Despite foolishly accepting the first OTA upgrade, I was still able to use the original Unrevoked to gain enough root access to get android-wifi-tether working (thanks to this XDA thread), which has been fantastic while traveling. It's been over two months, and the release of Froyo and Unrevoked Forever motivated me to do some upgrading. The following is the step-by-step tutorial I wish I'd had going into the process. 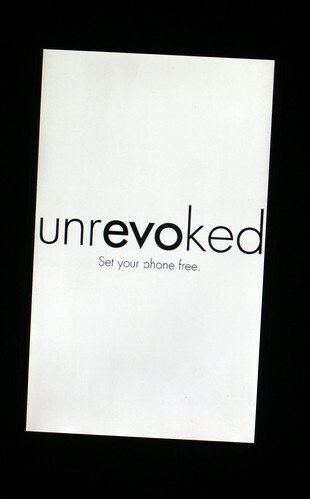 The assumption is that you've rooted, but not using Unrevoked3. The entire walkthrough is written with the goal of being as simple as possible for users who are new to doing their own updates, flashing new images, or even using Ubuntu. Unzip reflash.tar.gz (you can double-click on it to open File Roller, and hit the extract button); the result is an executable called reflash. Let's assume you extracted it in your Downloads folder. 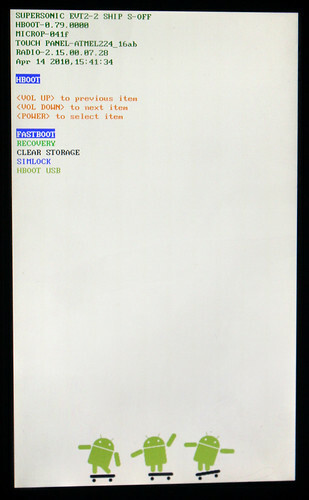 Now, run it as root by opening Terminal (Applications > Accessories > Terminal) and typing in sudo Downloads/reflash. It'll ask you for your password, and then it'll launch Unrevoked3. The UI that comes up has the Unrevoked logo and the message "Waiting for device. Plug phone in now and enable USB debugging. You may require Linux root access." Enable USB debugging on your Evo by going to Settings > Applications > Development > USB debugging and plug in your phone. From there Unrevoked3 just runs-- it reboots a couple times, and drops you off in ClockworkMod recovery (a dark-colored screen with greenish text.) Select "reboot system now" by pressing the power button, and your system will restart. When I compared my radio baseband version to those supported for Unrevoked Forever, I was dismayed to discover that mine wasn't listed. Time for a radio update, and a Wimax update for good measure. Conveniently, after I installed these two updates I no longer had to remove the battery before I could turn my Evo on after turning it off-- an annoying quirk that'd plagued me since I got the phone. How can you tell what baseband version you're running? You could restart your phone while holding the "volume down" button like the Unrevoked folks suggest, but it's easier to look in the Evo UI: Settings > About phone > Software information > Baseband version. Go to this XDA thread and download Radio update: 2.15.00.07.28 and Wimax Update 26023 from the first post. These are two zip files, Radio-2.15.00.07.28.zip and Wimax26023.zip. Save them to the root of your SD card. Turn off your phone, and turn it back on while holding the volume-down button. 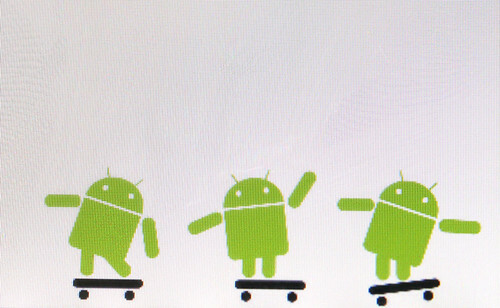 This will take you to the bootloader, a white screen with some Androids on skateboards at the bottom. The instructions say you can use the volume keys to navigate between options; on my Evo, it wouldn't let me do this for a few seconds, then it'd run HBOOT (a bunch of green text saying it's looking for various things and not finding them), and when HBOOT couldn't find anything then it would let me navigate to the other options. Select the update zip file, scroll through all the "no"'s and select "yes". The update will run. Repeat this same process with the other update zip file. To double-check if the update went through, check on your radio baseband version again, like before. One of my irrational fears is that one morning, as the alarm is going off on my Evo, I'll fumble and accidentally hit the button accepting an unrootable OTA update. 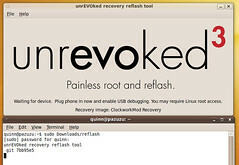 With Unrevoked Forever, you can still flash a custom recovery image if that happens, so I went to install it. (Update: it also lets you install AdFree, which you can't do with a normal Unrevoked root.) This step isn't necessary if you just want a rooted Froyo. Download the latest version -- it's a zip file, just like the radio and Wimax updates-- and put it on the root of your SD card. 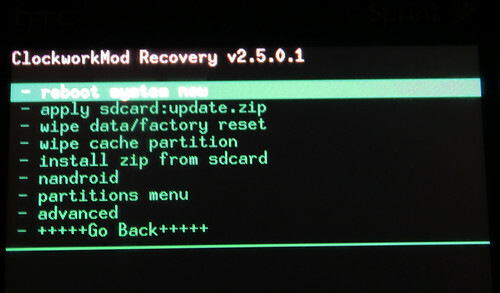 Follow the same process as before, using ClockworkMod Recovery to install zip from sdcard. When you reboot, if you hold down the volume-down button and go into the bootloader, you'll see SUPERSONIC EVT2-2 SHIP S-OFF at the top if it's been successful. If you want a custom Unrevoked splash screen (their Unrevoked Forever logo in black, very tasteful, which will replace the HTC Evo 4G logo on startup), download PC36IMG.ZIP from their website. Put that exact file, same filename and all, in the root of your SD card. Reboot into the bootloader (holding down the volume-down key); this time, HBOOT will find what it's looking for when it runs, and it will ask if you want to start the update. Choose 'yes', and then say yes to rebooting the device. I didn't want to re-install all my apps and reconfigure my phone from scratch, so I first went in search of a backup option. Choose Backup, then Applications (or Data-- you'll probably want to do them both), then Local (SD Card). Select the apps you want to backup, give your backup a name and choose APKs + DATA. The process is essentially the same for backing up data. Acquiring the ROM: Download HTC OTA Froyo 2.2, *FINAL*, build 3.36.651.6 (Rooted) Odexed from the first post on XDA. It's about 167 MB. Move it to the root of your SD card. Flashing the ROM: download and install ROM Manager from the Marketplace. 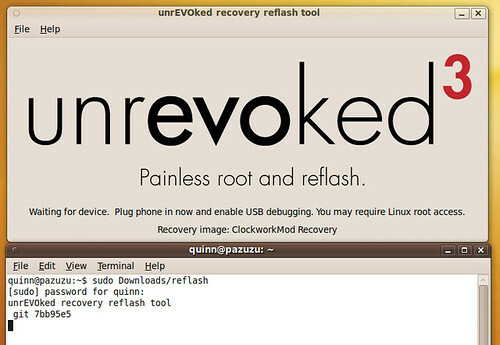 Select Flash ClockworkMod recovery-- it's counterintuitive, if you've already run Unrevoked3, but necessary. Confirm your phone model, confirm the Superuser Request, and the app will do the rest of the work. Choose Install ROM from SD card and select the Froyo ROM you previously downloaded. It'll give you check-box options for backing up your existing ROM and wiping the phone; certainly agree to wipe it, and you might want to back up your current ROM just to be safe. Getting your stuff back: download and install MyBackup again, and this time choose Restore. You can choose between Applications and Data, and then select the backup you made before. Restoring from MyBackup will return all of your apps and data, including your home screen layout and saved logins for your apps. I still had to re-configure the home screen for my browser, allowing the installation of non-Marketplace apps, etc., but it still saved me a lot of time. Wifi tethering: Froyo's native wifi tethering is still under Sprint's thumb, but android-wifi-tether didn't let me down-- I installed wireless_tether_2_0_5-pre8.apk, and it works great. Addendum: I initially had problems connecting to 4G after doing all this, and it seems I wasn't alone. The fix, helpfully suggested by cyberenz on the XDA forum, is to re-flash the Wimax update. Many, many thanks to the Unrevoked team: Matt Mastracci, Eric Smaxwill, Matthew Fogle, Joshua Wise, Ryan Pearl, and Koush Dutta. Not only do they do incredibly awesome work, they also direct all donations to the Electronic Frontier Foundation. You guys are my heroes.